Execution by crucifixion is a slow and agonizing way to die. We use the term “excruciating” to describe extreme pain, a word which comes from the latin exruciatus “out of the cross”. Hanging from iron spikes driven into the wrists made breathing very difficult as the weight of the body restricted respiration. The person being crucified had to push up with the feet, scrapping their scourged back against the rough wooden cross to order to gain a breath. The effort to push up was excruciatingly painful and tiring. This was movement was repeated for the duration of the ordeal, which might take several days until asphyxia, exhaustion, cardiac arrest or blood loss eventually resulted in death. Early readers of the gospel, familiar with the most extreme execution method of their times would likely have shuddered at all the bodily pain the word “crucified” conveyed. Yet, in the gospel accounts, very little detail is given of the physical suffering of Christ on the cross at Calvary. Matthew simply writes the few words in 27:35 “When they had crucified him”. The gospels describe in most detail the suffering of Christ’s soul. We read that Jesus was ridiculed by Pontius Pilate who, when faced with a plainly dressed Jewish Rabbi from somewhere obscure up north, had asked “Are you the King of the Jews”? In the same way the chief priests, the teachers of the law and the elders mocked him. “He saved others,” they said, “but he can’t save himself! He’s the King of Israel! 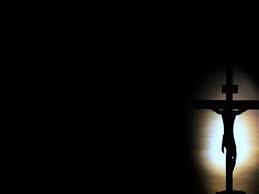 Let him come down now from the cross, and we will believe in him”. Then joining in the attacks on the perfectly innocent dying man were two guilty robbers/malefactors, also dying by crucifixion, who also heaped insults on him. For Christ, the excruciating suffering of the cross, was much more than physical pain, he experienced extreme anguish soul. Being separated from both earth and heaven, suspended in agony between both. Separated from the warmth and comfort of human fellowship, verbally abused by many as he slowly died, shallow breath by painful gasp. No experience you or I can have in this life can come close to the pain which Jesus suffered on the cross. No human re-enactment nor movie can represent Christ’s agony of soul. However, God has revealed to us in the gospels His words which describe the awful separation which Jesus endured for those he loves. The Bible helps us to remember with reverence, thankfulness and humility the price which was paid to ransom the souls of needy men, women and children like you and me. Fasting – a spiritual discipline for today?